US military may soon be filled with soldiers sporting Google Glass-like headgear that can measure distances, display 3D building layouts, transmit video from a drone and more, all on a glass display right in front of their eyes. Battlefields are full of data soldiers can use: enemy positions, the location of fellow soldiers, maps of a city or a house, video of what they'll encounter over a hill. But until recently, there's been no way to live-stream that data to soldiers on the ground. 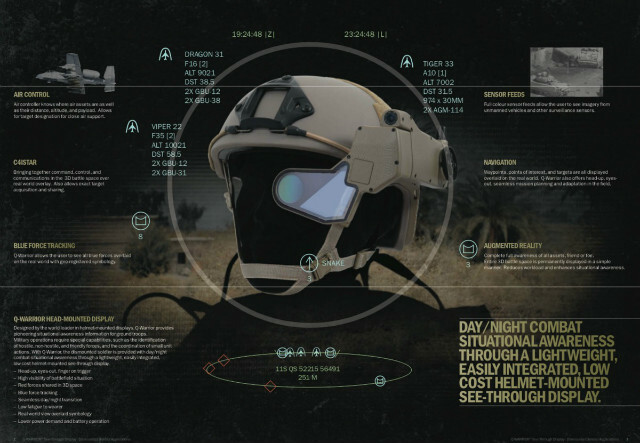 That's what Q-Warrior, high-tech headgear built by United Kingdom-based BAE Systems, provides. First reported by Wired, it gives soldiers a full-color, 3D display of what's happening in areas outside their line of sight, which has the potential to seriously boost a soldier's situational awareness. 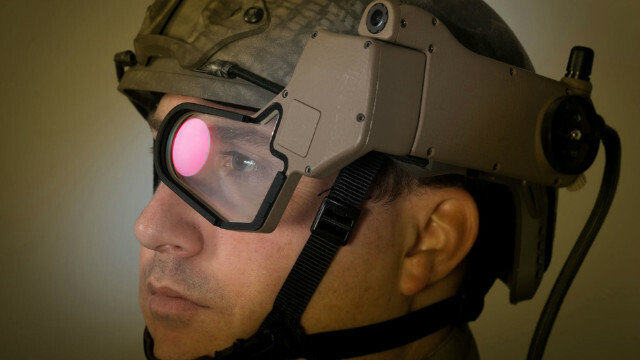 Though neither BAE Systems nor the United States military would confirm to Mashable that the two had agreed to a contract that would allow soldiers to test-run Q-Warrior, they both said it's only a short matter of time before soldiers will be sporting new eyewear. Lee's not talking about building the headsets or transmitting the data—the military and BAE Systems can already do that. What they can't do is ensure that the data stream doesn't cut out or that someone can't hack these helmets and steal drone footage. They need to know how much bandwidth it will take to transmit huge amounts of data to potentially hundreds of thousands of soldiers, how easily someone could block the transmission with a little electromagnetic interference, and how they can make sure the network is secure. And "then you've got the issue of distraction," Paul Wright, the business development lead for soldier systems at BAE Systems, told Mashable. "Whether the data is a distraction from the main task that a person is carrying out." With so much information available and transmittable, Wright and Lee said they need to understand what bits of data can help soldiers do their job and how much information is too much. Neither of them has figured out either of those things just yet, but they don't believe the answers are far off. Plus, Lee said plenty of soldiers want a headgear system such as Q-Warrior as soon as possible, and the military knows this kind of data transmission has the potential to provide untold advantages to American troops if they can get it running before any opposition. There's no set timeline for when a rollout will start, according to both Lee and Wright, but when it does, Wright said it'll probably begin with a select group such as a special forces team like the Navy Seals who took down Osama bin Laden. If the headgear proves effective, Wright said soldiers of all sorts are likely to follow suit, and the military will have made a revolutionary leap forward in computer-assisted warfare.